Motorstorm Pacific Rift, the new version of the Playstation 3 video game by Evolution Studios, is being launched on October 28 in North America. Bikes, ATVs, Buggies, Rally Cars, Racing trucks, Mud Pluggers and Big Rigs are being joined by a new class, Monster Trucks. Sony Computer Entertainment is promoting the game with Air Raid, a television commercial featuring sky divers and their vehicles. The Air Raid spot opens with close up views of riders and drivers preparing their machines for action. As the action unfolds we see them spill out of the back of a plane, one by one, tumbling through the sky in free fall, an island in view below. The words, “Lunatics Unite”, provide the cross over from live action to computer generated game play. The Motorstorm Air Raid was developed at Deutsch by copywriter Kevin Butler, art director Jacob Kahana, media planner Caleb Wines. Live action was shot on location at the Salton Sea, by director Klaus Obermeyer, via Aero Film, with executive producer Lance O’Connor. Stunt drivers and fliers were dropped from real airplanes, with sky-diving cameramen capturing the action. Post/VFX was produced at Eight VFX by supervisor Jean-Marc Demmer, executive producer Baptiste Andrieux, producer Marsi Frey, art director Yann Mallard, head of CG Fred Hopp, animator Yvain Gnabro, CG artists Shuichi Nakahara, Mathias Jourdes, Chien-I Kao, Julien Forest, compositors Nicolas Cadorette Vigneau, Joe Chiao. Audio Post-production was done at Human Worldwide and Eleven Sound. 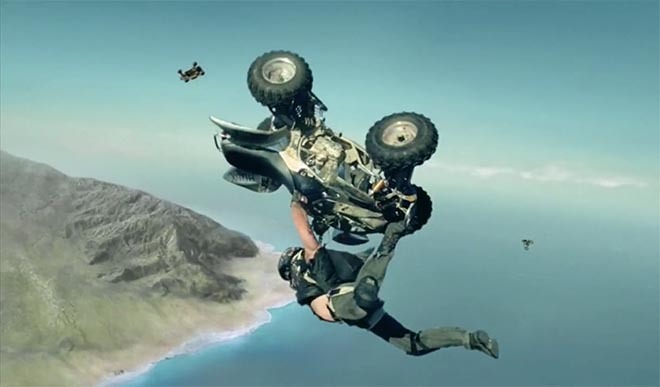 The Motorstorm 2 advertisement needed to convey a sense of the impractical while maintaining the visual authenticity of stunts executed by some of the best sky-divers in the world. To heighten the drama (no pun intended), Eight VFX created CG envinronments, airplanes, motor vehicles, and jumpers to populate the shots on top of the live action stuntmen. Music is “Wonderlust King” by NY multi-ethnic Gypsy punk band Gogol Bordello. Hear the whole track at Gogol Bordello’s MySpace site.